You are here: Homeother2.5mm2 DC 1500V single core PV cable solar cable for photovoltaic power systems with TUV EN50618 Approved. 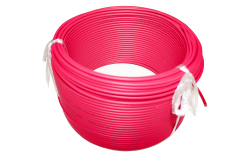 2.5mm2 DC 1500V single core PV cable,solar cable for photovoltaic power systems with TUV EN50618 Approved. TÜV PHOTOVOLTAIC CABLE H1Z2Z2-K 1xXXXmm2 1000VAC 1500VDC -40℃ R50344941 (EN50618) NINGBO FOLLOWRAY SPECIAL CABLE CO.,LTD.